Back in October 2012, New York Times writer Scott Shane described the idea of 'American exceptionalism' as an "opiate,“ inducing a kind of hubristic national stupor that prevents us from seeing things as they truly are. As Shane argued, the idea that American identity is a kind of calling can have positive consequences: “this national characteristic...may inspire some people and politicians to perform heroically, rising to the level of our self-image." But it can also be deeply dysfunctional, as politicians of all stripes trip over one another to reassure Americans "that their country, their achievements and their values are extraordinary," while profound problems are left unaddressed. American patriotism has always -- and uniquely -- had this 'Stuart Smalley' taint to it, but as we collectively whistle through the graveyard of apparent national decline, it seems to have over-ripened a bit. If John Winthrop's idea of America as the 'city on a hill' drawing the "eyes of all people" was to be more than just an expression of jingoism, it demanded (and demands) a delicate balance between description and aspiration. When it morphs into mere self-affirmation, however, we Americans become a danger to ourselves -- and to others, who increasingly keep their eyes on us for fear of what might happen if they don't. Sadly, as a recent international health study bracingly reminds us, most of the ways in which the United States is exceptional today are negative. The Institute of Medicine just released a study comparing American health care outcomes to other industrialized countries. 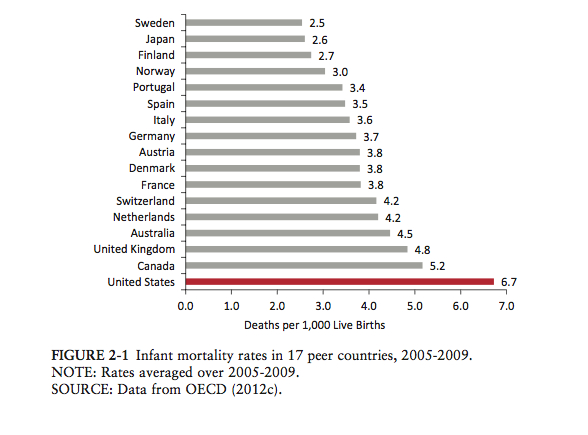 And all rhetoric about the U.S. having the 'best health care system in the world' aside, the realities are shocking. Despite spending far more per capita on health care than any other nation, the data make it abundantly clear that the American way of life has become nasty, increasingly brutish, and comparatively short. The optimistic takeaway here is that almost everything described below is attributable to (and capable of being ameliorated by) public policy -- in health, but in much broader areas as well. In other words, if we can once again rediscover our aspirational identity as Americans, change is possible. Physician Steven Woolf, a professor at Virginia Commonwealth University, chaired the panel that wrote the report. He and his co-authors were "stunned by the findings." Americans "have a long-standing pattern of poorer health that is strikingly consistent and pervasive" over a person's lifetime, the study found. The U.S. is at or near the bottom in virtually every health outcome: life expectancy, obesity, diabetes, heart disease, and homicide. We have much higher rates of death before the age of 50, accounting for most of the gap between the United States and our peer nations. According to the report, most of these poor health outcomes are attributable to poor childhood health. The USA has had the highest infant mortality rate of any developed country for several decades, due partly to a high rate of premature birth and low birth weight. Dr. Woolf and his colleagues also note that the U.S. has by far the highest rate of child poverty, though they don't really touch on its role as a possible cause. This gap, interestingly, has a history. The gap between the United States and its peer nations was relatively wide in 1950s and early 1960s, and then rapidly closed. Why did it close, and so quickly? Policy -- the 'War on Poverty,' including Medicare/Medicaid, among other programs, which for the first time began to connect millions of Americans to the health care system (and to food) on a relatively consistent basis. And then, right around 1980, the gap re-emerged. This coincided, not surprisingly, with Reagan-era cuts in public health and social programs; but it also coincided with an ongoing increase in economic inequality and insecurity. Since 2000, the gap between the U.S. and its peers has expanded. While infant mortality rates among African-American and Hispanics are high, this doesn't explain the gap -- white Americans have higher comparable rates as well. The report doesn't really offer any explanations for the infant mortality gap, or for the poor health performance of the U.S. more generally, beyond behavioral factors like drug abuse, calorie consumption, not wearing seat belts, and the ubiquity of handgun violence. I'm not a health expert, but I do think we need to consider one factor: inequality. While economic inequality within nations wasn't the focus of the Institute of Health report, we know from research by epidemiologists Richard Wilkinson and Kate Pickett that it strongly correlates with (and is reproduced by) health outcomes -- such as infant mortality (see above). First, nations with higher rates of economic inequality tend to have poorer health outcomes across the class structure -- in other words, while health outcomes are better the richer or more educated one is, they will still be lower than those of comparably placed people in more equal countries. The Institute of Health report confirms this. Second, economic (and educational) inequality and health outcomes are strongly correlated within societies. In the U.S., life expectancy for white women without a high school diploma is 73.5 years, compared with 83.9 years for white women with a college degree or more. For white men, the gap is even larger: 67.5 years for the least educated white men compared with 80.4 for those with a college degree or better. Because the United States is drastically more unequal than any other comparable nation, the socio-economic gradient is much sharper here -- and its getting worse. Indeed, we now have evidence that the life span of the least educated white Americans has actually contracted, falling a full four years since 1990. The numbers are worse for women. Some of this is attributable to changes in the labor market: the share of working-age adults with less than a high school diploma who did not have health insurance rose to 43 percent in 2006, up from 35 percent in 1993. While full implementation of the Affordable Care Act in the coming years may help somewhat, the deeper problems of rising inequality and economic insecurity -- and the debilitating stress and anxiety that accompany them -- remain. Poor health outcomes, as well as inequality, are greatly exacerbated in the U.S. by our social geography, and its intersection with the nation's original sin of race. American metropolitan areas have become increasingly segregated by income over the past two decades. We don't yet have a full picture of the health consequences of this trend, though it certainly is both a cause and a consequence of growing inequality during the same period. But we do know the health consequences of America's stubbornly persistent pattern of racial segregation. African-Americans not only have poorer health outcomes than whites overall; this is true even when income and education are held constant. More than 100 studies over the past decade confirm that racism acts as a classic chronic stressor, with serious physiological consequences: higher blood pressure, elevated heart rate, increases in the stress hormone cortisol, suppressed immunity. Chronic stress is also known to encourage unhealthy behaviors, such as smoking and eating too much, that themselves raise the risk of disease. Most of these investigations have been done in the United States, but a growing body of literature originates elsewhere. "Across multiple societies, you're finding similar kinds of relationships," David Williams, a sociologist at the Harvard School of Public Health, told the Boston Globe. "There is a phenomenon here that is quite robust." Racism also appears to have an impact on fetal and infant health, setting off a likely cascade of negative consequences. Epidemiologists James W. Collins, Jr. and Richard J. David have uncovered a disturbing fact: American-born black women are significantly more likely to have low birth weight babies than white women are, regardless of income level or education. The cause, they argue, is steady and life-long exposure to racism and its consequences. Since low birth weight correlates strongly with poor health (and educational) outcomes later in life, the relationship between race, place and health is clearly a big factor in the reproduction of racial inequality in the U.S. This relationship has been confirmed more recently in a widely publicized study in the January 2013 issue of the Journal of the American Medical Association, on racial segregation and lung cancer. After controlling for income and smoking rates, Dr. Awori Hayanga and his colleagues found that lung cancer mortality rates (a ratio of deaths to a population) were about 20 percent higher for blacks who lived in the most segregated American counties, than for blacks living in the least segregated counties. The more segregated the community, the higher the mortality rate for blacks -- and, disturbingly, the lower the rates were for whites. They surmised that differential access to health insurance and relevant and timely treatment were largely at fault. The research of Collins and David also directs us towards the stressors of racism itself, which are in part rooted in America's unequal racial geography. “If you want to learn about someone’s health, follow him home,” Dr. Hayanga, a heart and lung surgeon at the University of Pittsburgh Medical Center, told the New York Times. This message -- about the relationship between place, health, and inequality -- was perhaps most powerfully conveyed for an American popular audience by the award-winning documentary Unnatural Causes. In other words, our unequal and insecure American way of life is making us sick -- and more unequal. While the mechanisms that connect inequality with poor health outcomes are many and hard to disentangle, it seems clear that stress and insecurity are critical. Both affect the cardiovascular and immune systems, and both are found in abundance and in greater numbers in unequal societies -- and their effects are devastating on the young in particular. Thomas McInerny, president of the American Academy of Pediatrics, reacted to the Institute of Health study by pointing to recent research on the long-term impact of "toxic stress" on the health and cognitive development of babies and toddlers. "It's becoming increasingly clear that the first 1,000 days of life are critically important for children's development, and can determine the course of their life span from then on," McInerny says. "Investing in children in the first three years of life provides higher returns, for improving their productivity as adults, compared to intervening later." These correlations and comparisons make one thing clear: America's poor health outcomes, particularly for our children, can be ameliorated. Why? Because the differences between the U.S. and its peers, ultimately, are policy differences -- and thus are amenable to collective action. We can make America healthier (and more productive) by making it less unequal, and by investing in pre-natal care, early childhood health, and high quality and universal pre-school. "We already know what to do," Dr. Woolf says. "It's more a matter of having the resolve and resources to actually do it." Notwithstanding the false scarcity of our current austerity politics, we have the resources. Notwithstanding the libertarian and narcissistic braying of the privileged, our well-being is ultimately inseparable from that of our fellow Americans. Whether we have the resolve to see this will ultimately determine whether the term 'American exceptionalism' serves to damn or praise our national experiment. Same Love, Rhode Island. Same Love. First, listen to this song. I guarantee, it will hit you hard. Macklemore deserves some serious respect, for bringing the message of acceptance, equality and love into a hip-hop community that has too often lacked it. So, Washington state -- where Macklemore is from -- passed marriage equality. So why not Rhode Island? Off to see Louis CK tonight in Boston, with a jolly caravan of folks. Here's one of my favorites -- I use it in my Color Line in Modern America class. Most white males seem to intuitively get the latter part, about losing privilege. Most white males don't seem to get the first part, about having privilege. It is often said that you know you have a good deal, when all sides walk away from the table a little unhappy. If that bit of folk wisdom is true, the recently passed 'fiscal cliff' compromise appears to be a good one. By and large, the deal Obama achieved isn't a disaster. I will praise a few parts of it below, and criticize others. But on balance, I think it would have been better to go over the mythical cliff, pocket the increased revenue, and then prevail upon Congress to pass middle class tax cuts and extend the payroll tax cuts. The GOP was powerless to stop the former, and would have been hard-pressed to reject the latter. It is now no longer possible to get increased revenues out of Congress. And we can neither address our common needs in the coming decades, nor stabilize the debt-to-GDP ratio, without them. First, learn a little history by going to this Dylan Matthew post on how we got here. Trust me, its hilarious. Seriously. Now, back to me. Color me skeptical about the entire state of our policy discourse at present. I refuse to accept the legitimacy of the economic assumptions underlying this so-called 'crisis,' and fear that by engaging in this back-and-forth dealing, Obama and the Democrats have reinforced those assumptions. Essentially, anything that doesn't reverse our slide toward austerity is bad policy. A deal that accelerates that slide -- or that lays the ground for such an acceleration -- is a disaster. With regard to the $120 billion in budget cuts (the 'sequester'), the can was kicked 60 days down the road. But it will come to a spinning stop at approximately the same time that the debt ceiling crisis hits. Ultimately, whether Obama acted responsibly in the negotiations that just concluded will be determined by what comes next. And on that, I'm not optimistic. While Obama did bend a bit on the size and reach of the tax increases on the wealthy (thus trading progressively-generated revenue for likely and regressive spending cuts), he didn't give in on entitlements. He certainly sounded the right notes in the wake of the House passage of the deal. When asked about the impending debt ceiling confrontation, Obama declared, “While I will negotiate over many things, I will not have another debate with Congress over whether they should pay the bills they’ve already racked up.” Perhaps he will take Bill Clinton's advice, and invoke the 14th amendment to unilaterally raise the debt ceiling (or abolish it). That is an enormous bargaining chip; let's hope he doesn't give it away at the outset. It should be permanently invoked anyway. From the White House's perspective, they got most of what they wanted in the fiscal cliff negotiations, by hanging tough. Perhaps they have finally been convinced that negotiating against yourself (or assuming you are conversing with a rational interlocutor) isn't wise. 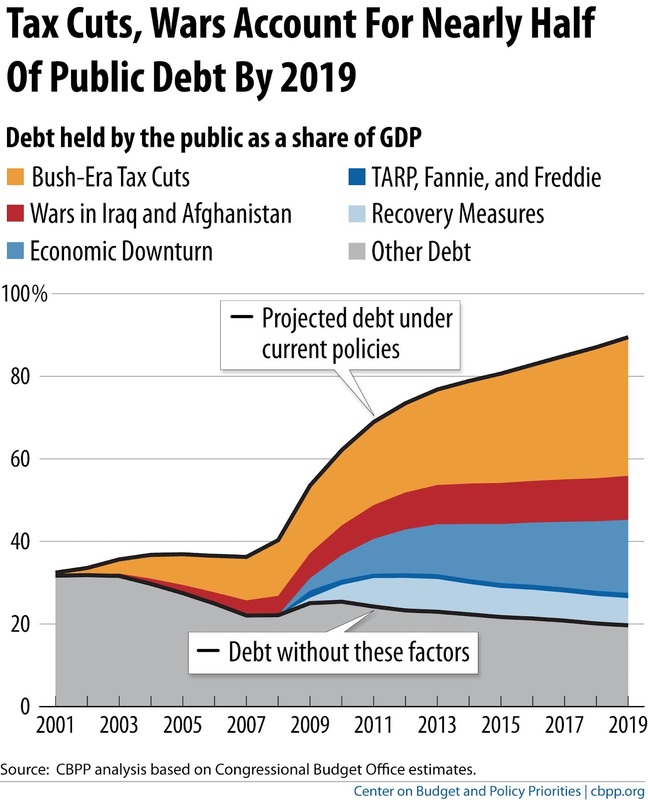 I hesitate to see the deal as positive -- for Obama, for the Democrats, and for the country -- because this whole manufactured crisis relies on one central (and false) premise: that the first economic priority for the US is to get the deficit under control. Most Republicans (and mainstream pundits of all stripes) continue to believe that our slowly growing economy is some sort of divine punishment for our fiscally profligate ways, despite a complete lack of supporting evidence. The idea that cutting government spending will be good for the economy right now is roughly akin to using leaches and bloodletting to cure illness. It only makes sense when embedded within a larger paradigm, one which is internally consistent (and thus appears to be coherent to those inside it), but is otherwise empirically false. There were no budget cuts in the deal, and Obama deserves praise -- for protecting Medicare and Social Security, in particular. But the cuts are coming. And the back-and-forth over the fiscal cliff deal (as well as years of precedent) hasn't given me great confidence in Obama's negotiating abilities. The vast majority of the present deficit is attributable to 3 things: the economy (first and foremost), the Bush tax cuts, and the wars. The fiscal cliff deal touches only on the second part, and mostly leaves those cuts in place, relative to a return to the Clinton status quo ante. There is, of course, a likely structural deficit over the long-term, and it must be dealt with. But the primary culprits there are well known: rising health care costs, the possibility of low economic growth over a prolonged period (a 'lost decade,' which the deal does little to prevent), and a tax system that doesn't raise enough revenue from the nation's wealthiest households to fund our basic needs or invest in our future. The deal isn't a disaster, and I should praise before I criticize. Even if one assumes Obama could have gotten a slightly better deal, under the present circumstances he did manage to keep some disastrous options off the table. My worst fears -- an increase in the eligibility age for Medicare, a cut in Social Security benefits through the chained CPI -- didn't materialize (yet). One can assume, however, that the GOP will try to use the debt ceiling to put this and more back on the table in the coming months. Obama's role in all of this will ultimately be judged by his combined response to the 'fiscal cliff' and the debt ceiling negotiations. If he caves on the latter, it will be difficult to judge the deal passed yesterday as a good one. The immediate crisis is unemployment, not the deficit. Most of the time, the president acknowledged this publicly. And it is to Obama's credit that he managed to get an extension of unemployment benefits in the deal, as well as various tax credits that are generally taken by working families. The payroll tax cut, however, is gone. And the focus remains on budget cuts, not stimulus. There are of course 4 other long-term structural problems, which aren't even on the table at the moment: inequality, our broken opportunity structure, our atrophying public sector, and the need to reboot our economic, energy, land use and transportation policies to address new climate and fuel realities. All 4 are corrosive of our economy, and our democracy. And all 4 require more tax revenues in the coming decades (and less defense spending). The debt ceiling showdown was not averted. In Obama's initial negotiations with Boehner, he made it clear that he wanted a permanent solution to this ridiculous legislative practice. As Paul Krugman pointed out recently, "the key thing to remember — and what the GOP hopes you won’t understand — is that raising the debt ceiling only empowers the president to spend money that he’s authorized to spend by Congressional legislation; nothing more." In the modern age, there is no good reason why there should be any debt limit, let alone one that must be raised each year. Obama continually gave ground on this, with no corresponding concessions from the other side. In the 'fiscal cliff' deal he gave it all away, enabling the Republicans to once again take the world economy hostage in a few months, in order to achieve policy victories that the American people clearly rejected just a few months ago. As I noted above, he should follow Bill Clinton's advice and invoke the 14th amendment to eliminate this annual song-and-dance once and for all. The estate tax remains way too low. The estate tax serves two vital purposes: it raises revenue to pay for public goods, and it helps to at least partly maintain equal opportunity over time, and across generations. As part of the fiscal cliff deal, the estate tax will rise to 40 percent from its current 35 percent level, with the first $5 million in assets exempted ($10 for married couples). Democrats had earlier sought a higher increase to 45 percent and a lower exemption of $3.5 million. Had we gone over the 'fiscal cliff,' the estate tax would have reverted to Clinton-era levels (remember that socialist utopia? ): a $1 million exemption, not indexed to inflation, with a 55 percent tax rate. First, a little background on this confusing topic. The 2001 Bush tax cuts shrunk the estate tax dramatically. By 2009, the first $3.5 million of the estate of an individual — effectively, the first $7 million for a couple — was exempt entirely from the tax. A tax that had affected only the largest 2 percent of estates in 2001 touched fewer than three-tenths of 1 percent of estates by 2009. And by 2009, the tax rate applied to the portion of an estate’s value that exceeded the exemption level had declined to 45 percent, down from 55 percent under the prior law. Because the estate tax applies only to the value of the estate that exceeds the exemption level — and because of other tax breaks built into estate tax law — the effective tax rates faced by estates that are taxable are generally much lower than the statutory estate-tax rate. Graduated rates for larger estates would bring this effective rate more in line with the statutory rate, while ensuring that the revenue burden of the estate tax is borne by the very wealthiest households. We did not get a graduated rate system yesterday. While raising revenue isn't the only -- even the primary -- justification for the estate tax, we aren't talking about chump change here. Take a look at the differences between the various options over the next decade, in terms of money flowing into the public till, in the chart below. The bar on the left applied in 2011 and 2012, and was set to expire on January 1st 2013. The second from the left was Obama's negotiating position. The one on the far right would have kicked in yesterday, in the absence of a fiscal cliff deal. While the numbers that were ultimately agreed to aren't on this chart, one can reasonably assume they fall between $182 billion and $284 billion over the next 10 years. Thus, the revenue difference between the new estate tax system and the one that existed when Bush took office is over $300 billion in the coming decade. Relative to the size of the deficit (and the likely size of the economy in the coming years), this isn't a ton of money. But when one thinks about it either in terms of what that revenue could purchase and multiply, or in terms of who will carry the burden of spending cuts, the cost is of greater consequence. I do think one can make an argument that the exemption ($1 million) was set too low prior to the 2001 Bush tax cuts, and that a reformed version would include a substantially higher exemption with graduated rates for bigger fortunes above the exemption level. In other words, the estate tax could be made more progressive -- affecting fewer people -- while simultaneously raising more revenue. But that's not what we got yesterday. Instead, the two parties and the White House agreed to pass up over $30 billion a year in revenue from the wealthiest Americans -- more, if a graduated system had been created instead. This is revenue that the GOP will attempt to claw back from ordinary Americans in a couple of months, when we bump up against the debt ceiling. Good rule of thumb: every dollar in spending cuts is likely to affect working families and the economy more negatively than each dollar of tax increases on the wealthy will. And while taxes on the wealthy just went up a bit, they also went up on everyone else, because of the expiration of the payroll tax cut. $30 billion a year, by the way, would get us more than half way toward a high-quality universal pre-k system. As my father and I proposed in our 2005 book, this would be an entirely appropriate way to spend estate tax revenues. The economy is spinning its wheels, at about $1.5 trillion below its potential. At least 15 million people are unable to find full-time jobs. Despite this, the debate remains fixated on the question of how to cut the deficit instead of how to restore jobs, wages, and output. Obama must shift the focus to economic recovery, and away from austerity. And he can't do this if his initial negotiating positions already concede recovery (and stimulus) as a lost cause. My problem with Obama's negotiating approach isn't so much that he concedes things to the GOP when they're at the table. That's what happens in a negotiation, though presumably one gives something up to get something. My problem is with what he brings to the table in the first place. One should always carry two things into a negotiation: a wish list, and a giveaway list. The wish list should include everything you'd want to see in a possible and realistic deal, but it should also include things you'd love to have but know you probably won't get. And then you start the negotiations by taking things on the 'love to have' list, and either shrinking them or moving them to the 'giveaway' list, in concert with appropriate moves by the other party. Historically, Obama has given away most of his wish list before entering the room. He did this with the stimulus bill back in 2009. He did with health care too. And he did it with the Budget Control Act in 2011. He did better this time, but we won't really know the ultimate outcome for a couple of months. Unless Obama continues to play hardball on all fronts, the risk is that he will consent to budget cuts as the price of the next deal, at a time when the economy needs more public spending, not less. He needs not only more spine; he needs to alter the terms of debate, rejecting not only the ideology of Republican right but the economic idiocy of the corporate center, which has persuaded elite opinion (including at the White House) that recovery requires debt reduction. Do you have confidence that Obama can do this? A lot hangs in the balance.